Moving on: the good fun speed work and short race period is coming to an end and it’s time to ramp up the miles. 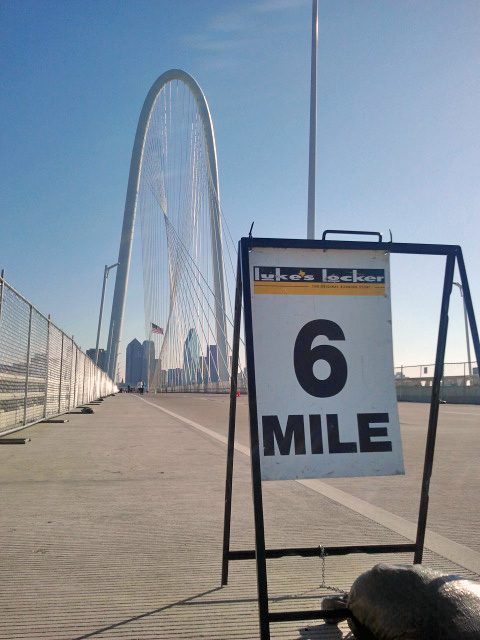 So, here’s the deal: following the White Rock Dallas Marathon I took a couple weeks very easy. Then I got the flu. Kept running. Got the flu — the for real flu and was in bed for a week. Things got off to a rough start, but sometime in January, I began my training for the May 5 Vancouver Marathon (which also is my spring break and summer vacation rolled into one). I started off, to put it simply, by training for a 5k and training for a 10k. Until recently, I could not break 20 minutes in a 5k, early in the season I ran a 19:32 on a net downhill course. Two weeks ago I ran a 19:17 at the Form Follows Fitness 5k, which ended with a crazy uphill stretch. 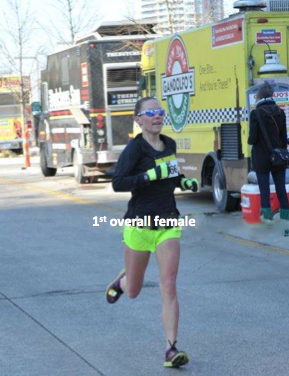 This, by the way, was a fun February race through downtown that ended at the aesthetically pleasing Woodall bridge park. Trinity bridge opened for the Trinity Levee 10k. Last season’s 10k PR, under this same type of training was a satisfying 41:49. Last weekend at the Trinity Levee 10k, my official time was 40:45. Either the course was a bit long or I did a bad job of running tangents, because by my Garmin, my slowest mile was 6:30 and all except one was 6:24-6:26. Anyway, I plan to run another 10k in a couple of weeks to see if I can break 40, which is the goal. Early on in this training, end of January, I ran a 1:29:04 at the 3M half marathon. Next month I hope to, and feel that with good weather I can, break 1:28 in the half. I registered yesterday for the Fairview half marathon. Monday: Track — 12x400s or 12×800 or 6×1600, something like that. These are always very tough. Sometimes I don’t sleep Sundays just thinking about how much they hurt. Like 5:50-minute miles or 82-second 400s. Often I could not hit the prescribed pace, but I tried my damnedest. Note: the longest run I do all season is 2 hours I wrote a separate post to explain that. My goal for the Vancouver Marathon is something like 3:10. I really like reading about runners and their training schedule. I find it really inspiring and yours is just the same. I just wanted to say thank you for sharing such great advice and stories on your blog! I’ve taken a look through your website and we think you’ve done a fantastic job in covering topics that our brand’s active audience would be interested in reading about, such as walking, running, hiking, mountain climbing, etc. It would be great if you could join our community to feature your blog entries.